Mineta San Jose International Airport rolled out a new fleet of robots Tuesday to help passengers. 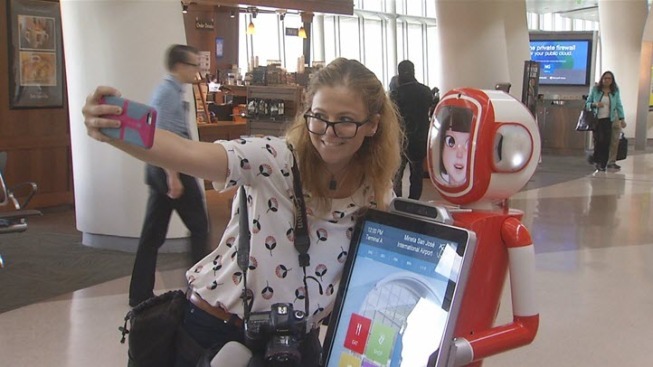 The robots will be stationed at terminals A and B and are already popular with tourists. "What they will do is engage, entertain and assist travelers," said Rosemary Barnes, San Jose International Airport's spokesperson. The robots come with 32-inch touch screens and speak six languages. "Silicon Valley's airport is a host to tech-savvy travelers, both business and lesiure," Barnes said. The software installed in the robots comes from Bay Area-based Future Robot, Inc.
"Instead of just a store kiosk, or screen, we have eye contact," said Paul McManus of Future Robot, Inc. "This is just the beginning. In the future, we'll add artificial intelligence." The robot will also take a selfie of you and send it to your smartphone. Airport officials said the robots do not record audio or video. Authorities also said the robots stay in a small area at the airport to help avoid the chance of bumping into small children.